the full pathname of the MIDI file, it is a path into the Windows temporary folder and filename starts with new00 if the file is temporary (not saved yet). the version (also called MIDI format or MIDI type) is a number between 0 and 2. 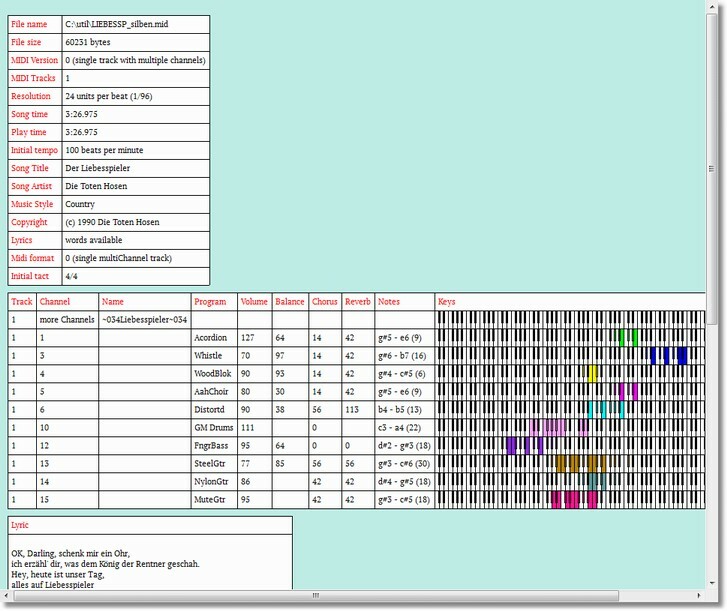 Version 0 MIDI file has only one track that contains all MIDI commands of all channels sorted by time. Version 1 MIDI file has more tracks, where first track is reserved for conductor and all other tracks should only contain one channel. Version 2 MIDI file has more tracks, where each track is a new song. The number of tracks in the MIDI file. Each track can contain MIDI commands. The resolution tells about the smallest possible note and pause steps in the song. 24 units per beat means that the smallest note length would be a 1/96 note. The tempo that is used at start of the song, it is 120 beats per minute if no tempo is specified by the song. Copyright text of the MIDI publisher. tells if lyrics are inside the song and which format it uses (karaoke words, lyrics, other). Each track can contain MIDI commands (channel number is shown in  if the track has exactly one channel), a track title. A GM instrument name is shown that is used in this song (if the file will be played with a General MIDI device). Window settings can extend this short track info to verbose track info, which tells also other initial parameters that are used in this track. The song can contain text information of different kind. This information is collected here for each of these types. More fields are shown when extra information is added by the user e.g. artist, song title, melody channel, transpose value, rating, comment. The buttons Full/Middle/Karaoke may be used to move the splitter of this window to a position that the upper information part is fully visible or the bottom karaoke part is fully visible or both parts are visible. There are also options in menu window available. There is an option in menu settings to show verbose track information. The text can be copied to clipboard (Ctrl-C) or to a text editor (Ctrl-E). /* U0 */ /* 0ms */ trackname "Liebesspieler (Die Toten Hosen)"
/* U0 */ /* 0ms */ copyright "(c) 1990 Die Toten Hosen"
/* U0 */ /* 0ms */ marker "sequenced 1998 by GN"